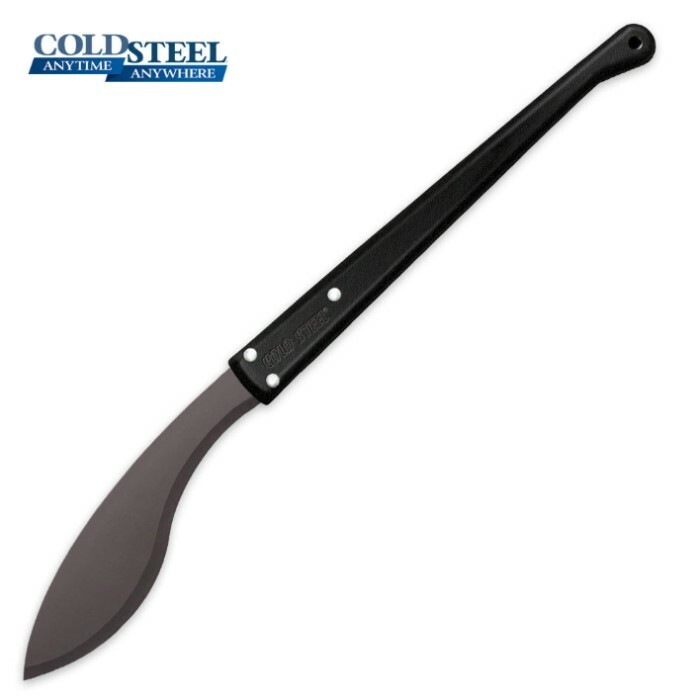 Cold Steel's two handed Kukri Machete offers so many advantages as a tool or weapon that it"s hard to know where to begin when attempting to describe them. Small trees saplings, vines, thorn bushes, cane, reeds, bamboo, corn stocks and sugar cane all fall to its over sized 13" 1055 carbon steel blade with a baked on anti-rust finish and long polypropylene handle. Overall Length: 33 3/4 in. Steel: 1055 Carbon Steel w/ Black Baked on Anti Rust Matte Finish. Handle: 20 3/4" Long Polypropylene. THIS THING IS AMAZING!!! wasnt too sharp when i got it but once i put a real edge on the blade i tell you what one swipe at whatever im swinging at and its coming off lol cant be more satisfied this would def be approved for a zombie engagement. this sucker is super sharp. i cut down some small trees and large roots with no problem..just keep the blade clean and sharpen it every few uses...price vs use is excellent. worth every penny...also good for zombie attacks as the handle is very long!